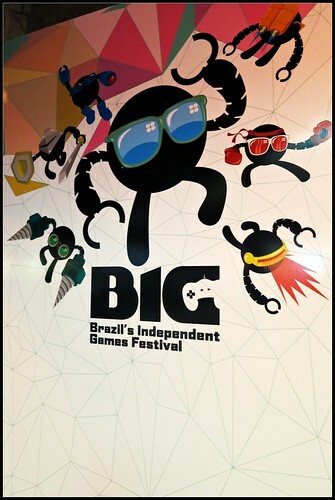 I spent the first half of the week in São Paulo, Brazil, to take part in Brazil's Independent Game Festival. I had been invited to give the design keynote to the assembled ranks of eager game developers, publishers and other local business types. I wasn't sure what to expect, it was my first time visiting Brazil, but the whole experience was fantastic. The passion of the local developers shone through, and I lost count of how many great conversations were had, both with the assembled Brazilian developers, and the visitors from the US and Europe. The set-up was in the city's cultural center and it made for a very fitting venue, which had a kind of cool, underground lair, feel going for it. There was a good mix of local and international guests, and I was honored to have been asked to give the keynote for the design side of things. I was very pleased with how well the session was received, and it seemed to strike a chord with the audience. It's always a little daunting giving a speech in a foreign country where you are reliant on translation, but everything went smoothly, and we were graced by a talented translation team! More than anything though, it was cool to get to meet other developers and get to see some games I hadn't seen before. While some of the nominations were games that have already garnered a good deal of positive press (and indeed my playtime!) like Papers Please, The Banner Saga, The Stanley Parable, and Nom Nom Galaxy (which eventually picked up the top prize) there were also a few games I was seeing for the first time, and some great local games. Gorogoa, from solo dev Jason Roberts was a revelation for me. It's a gorgeous little puzzle game, with wonderful hand drawn art. Getting some time with it's creator just increased my admiration and I'll be waiting eagerly for the full release! It's smart, engaging and beautiful. Check out the demo on his site for a taster! Ephemerid by Super Chop Games might not be described as a game by some, maybe more of an interactive album of music, but I found it enchanting none the less. With a soundscape that has a unique guitar driven sound that in many ways evoked 70s concept rock to me, but hit it's own notes. It comes out in a few weeks on the iPad, well worth taking a listen! It was also great to hear Jamie Tucker from Asteroid Base talk about their upcoming, and much anticipated indie title, Lovers in a Dangerous Spacetime. That was easily one of the most popular games on the show floor, and represents some great co-operative fun. I also got to play Bounden for the first time, which, in particular for someone as uncoordinated as me, is surprisingly fun! It's another one that is due out very soon! From the local teams, two stood out for my personal taste. First was Chroma Squad, which finds it's inspiration in strange Japenese TV, and you find yourself trying to create a Power Rangers style show, and play out the 'episodes' in suitably zany turn based tactical game-play. If it sounds a little surreal that's because it is, but it also plays well, and has a neat retro style. Then there was Like A Boss from Fire Horse studio, which in many ways takes it inspiration from games like World of Warcraft. Basically the usual roles are reversed and you take on the role of an MMO raid boss and have to dispose of waves of pesky raiders who attack you, intent on stealing your loot! It's a well paced and fun concept, and the beta version I got to try was already playing very well. I'll be tracking this one! These guys walked off with the prize for locally developed games. Then we also got to talk to a whole bunch of other local teams at various stages of developing their ideas and games. There was a pitching competition that was won by Prosperity Games with their Jotunheim project, which is a giant robots meets pokemon style game based on Nordic myths. Another intriguing project was Tetragon. The team let us play an early version of the game on the web for some feedback. Even early on the game is interesting, and the mechanics appealed to my puzzle solving mind. Another one I'll be following as they keep polishing and building. All in all it was a very rewarding trip, and I can't speak highly enough of our hosts, and all the dev teams and people I spoke to. So many great folk, and so much passion for game development. It was an honor to get to go and meet everyone!